Posted on Tue, Mar 20, 2012 : 5:59 a.m. Neighbors were concerned this winter about 1480 South Boulevard, as long-time owners moved out of the central Ann Arbor home and Fannie Mae posted its notices on the front door. But having a bank-owned, vacant home in their midst took a sudden and urgent turn this month as they realized the house was also close to collapse. The crumbling masonry foundation has deteriorated at 1480 South Blvd. in Ann Arbor, leaving wide holes that expose the basement of the house. Now the city is taking steps to get it torn down — and fast. “If it doesn’t get taken down, it will fall on either my house or the (other) neighbor’s house,” said Paul Bauer, who owns the house to the west. The issue is a matter of safety, agreed Ralph Welton, chief development official for Ann Arbor, since the weight of the house is resting on the wooden beams at the base of the structure. “The foundation caved into the basement,” said Welton. That’s true around the perimeter of the home, but most visible on both the east and west sides, where gaping holes expose the basement — and the crumbling block that formed the home’s foundation for decades. The two-story, 1,152-square-foot home was vacated around the end of the year, neighbors said. The property had been registered to Gyll and Diana Stanford, but a March 2011 foreclosure left Fannie Mae in control of it. City assessors put the home’s value at $69,900, which would give it an estimated market value of about $140,000. At the time of the sheriff’s sale, a little more than $210,000 was owed on it. Arnulfo Rodriguez owns the house to the east, which faces Packard. He said he wanted to buy the two-story home as he realized it was bank-owned. “I was thinking it could be repaired,” he said. But that changed early this month, as the degree of damage to the home became visible. As he looked recently at the crumbling block at the base of the home and pointed to the roof, where the lack of gutters led to rot, he shook his head. He said it was obvious that the bank would have to act. And lose its chance to recoup its investment: “Now they don’t have a chance to sell it (either),” he said. The house at 1480 South Blvd., just west of Packard. Leaving it standing can’t be an option, he added. That’s the fear of Bauer, who lives just a driveway away from the disintegrating structure in a home that his grandfather built in the 1920s. His home is a single story structure, leaving him worried that a collapse of 1480 South will send debris flying onto his own house. He’s seen that house in better days, and Bauer said its history involves being moved from its original location long ago. The city assessor said it was built in 1922, but Bauer believes that when it was moved, it was placed on a foundation that was too narrow for its weight. “It held up for some years,” he said. But the disrepair of the roof and other issues seems to have been its downfall. There are signs in the basement that the previous owners tried to shore up the basement walls with wood beams. Bauer said the city came right over to the house after he called officials and a representative of Fannie Mae in early March. “As soon as they saw it, they said it has to come down,” he said. Contractors have been to the scene, and Welton said Fannie Mae is working with the city to get the house demolished. Two bids were considered, and permits should be issued shortly. At the same time, Welton said, he’s pursuing the utility cut-offs and other steps needed to take the house down. The urgency is more acute than in other cases of abandoned property in the city, he said, but he’s hoping the fast turnaround that avoids litigation and pulls the ownership into a solution that can be effective at other sites. 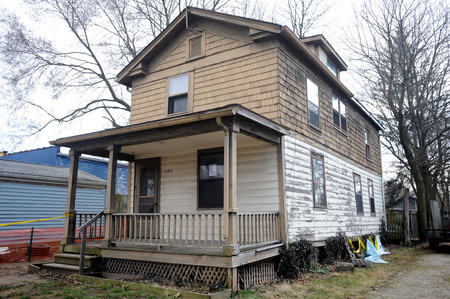 The city recently started a blight fund to target problem properties. “I think this cooperative approach will be vital in dealing with other foreclosed properties (in poor condition) in the city — in terms of securing, repairing, or demolishing,” Welton later said by email. Wed, Mar 21, 2012 : 12:07 p.m.
Man from city says: &quot;The issue is a matter of safety, agreed Ralph Welton, chief development official for Ann Arbor, since the weight of the house is resting on the wooden beams at the base of the structure.&quot; Former owner says: &quot;This structure is supported by steel columns and beams run across and lengthwise in the basement.&quot; these two versions are not the same. Who does one believe? I apologize for the tone of my last post Paula, I could have been less abrasive. But you are essentially accusing Gyll Sanford of lying based on what? An observation that may be meaningless. Indeed if Gyll is correct then your observations from the driveway are meaningless. As a reporter you should seek all the facts rather than besmirch people based on partial information. Wed, Mar 21, 2012 : 2:41 p.m.
further more Paula if your going to be a &quot;reporter &quot; you need to ask real questions. What &quot;building trades&quot; do the neighbors practice? A plumber, a roofer, an electrician and a structural engineer are all in the &quot;building trades&quot; but only one of them has the legitimate credentials to assess the stability of the house. And again if there is steel inside as Gyll states the house can very well be stable despite outside appearance. Wed, Mar 21, 2012 : 2:36 p.m.
with all due respect to the neighbors &quot;in the trades&quot; its possible for a house to be fully supported by steel beams and the old foundation have no structural purpose. That is how foundations can and are rebuilt. So what you see and touch from the outside may say absolutely nothing about whats holding the house up. Wed, Mar 21, 2012 : 1:48 p.m. I talked to two neighbors who are in the building trades and they both expressed serious concerns about the stability of the home. One touched the exposed foundation on the east side of the house with his fingertip and it started to crumble. 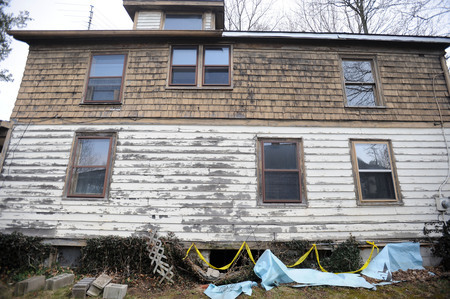 That &quot;crumbling&quot; extends for several feet along both sides of the home. I can't imagine anyone stepping into the house or basement to make an assessment. Though you wouldn't have to. It's fully visible to anyone standing in the driveway. Wed, Mar 21, 2012 : 1:38 p.m.
kind of what I was thinking Gyll. I'm not one to take anything &quot;the city&quot; says as accurate without confirmation. Wed, Mar 21, 2012 : 12:56 p.m.
One might be inclined to believe the individual who installed the beams over 30 years ago, rather than the individual who comments from a bureaucratic report passed up to the Ivory tower. I thought it funny and ironic that one of the rolling ads touted refinancing and pulling money out. Wonder how we ever got in this mess? Yep, I really wonder. Wed, Mar 21, 2012 : 12:11 a.m.
Collapse? I don't think so. I know this house inside and out (it is a post and beam constructed building) the weight is not a uniformly spread load along the foundation. This structure is supported by steel columns and beams run across and lengthwise in the basement. Let me shed some additional light on the matter. Due to the condition of the foundation, my design plan included replacement of the foundation along with several creative ideas that would enhance this home and the surrounding properties. This plan included raising the structure up by about 2 feet for additional basement headroom, and better exterior design proportions. Daylight basement windows were planned to create more light filled livable square footage in a small house. This property is only 38 feet wide so any first floor addition is not feasible, that made the, &quot;basement addition,&quot; the best direction of expansion. The plan still has merit and would be a great opportunity for the next buyer. It will be a shame if the city tears it down, the only other repairs needed are cosmetic siding and roofing. When the loan was obtained the appraisers inspected the property and approved a loan for a building appraised at around $235,000. All indications we saw from the real estate market, appraiser, loan officers and equity in the property indicated this long term plan had merit. The collapse of the housing market, failure in the banking industry, lay-offs and rising unemployment changed the feasibility of moving forward with the plan. Wed, Mar 21, 2012 : 12:05 a.m.
Now, how about those boarded-up buildings on N. Main St.? Looks too much like parts of Detroit, and definitely not a very nice welcome to annarbour. Tue, Mar 20, 2012 : 9:03 p.m.
Tue, Mar 20, 2012 : 6:48 p.m. The mortgagee that let the house go back to the lender should be liable for the whole mortgage less the value of the property, once the building is history, correct? Tue, Mar 20, 2012 : 9:48 p.m. I believe the lender has a certain number of years to go after the balance (maybe something like5 or7?). I'm not sure they bother much these days, but that is a guess. Tue, Mar 20, 2012 : 6:05 p.m. The fact that someone was living in this dangerous structure until last year is a huge issue. It's obviously unsafe and yet it was occupied. Why didn't the city condemn the structure long before this and evict the owners from an unsafe structure? Totally irresponsible on the part of the city to allow this structure to be occupied for that long, and it is still standing while the city talks about demolishing it. Just do it! Tue, Mar 20, 2012 : 5:28 p.m.
One more classic example of our &quot;throw away&quot; society. Wait, don't have building inspectors tell the new purchaser he needs to shore up the foundation... Wait, don't inspect a property when issuing new financing... on and on it goes... Then quick give some removal contractor a sum of money to throw away what could have/should have been a salvageable building. I suspect that sweat equity and the amount of money required to pay for removal could also effectively shore it up and make it inhabitable if the money and the title to the property were distributed to a responsbile and qualified low income citizen with the requisite common sensse skills we should be teaching in our schools! Tue, Mar 20, 2012 : 6:13 p.m.
Salvagable? With no foundation? Did you look at the picture? Tue, Mar 20, 2012 : 5:30 p.m. But wait... we didn't teach those common sense skills to this generation... we threw them away too! Tue, Mar 20, 2012 : 4:42 p.m.
Gyll Standford s the owner of Standford Enterprises, a building contractor. From the former owner's business website: &quot;We moved a house, and set it up on a new foundation, whole house rehabilitation with all systems upgraded....&quot; Sounds like he knew there was a problem with the house and abandoned it before it collapsed. Tue, Mar 20, 2012 : 4:14 p.m.
Tue, Mar 20, 2012 : 3:04 p.m. There are many occupied homes that are clearly allowed to become blights. If you own a home, you need to have a plan for maintaining your home and the surrounding property in a way that does not negatively impact the surrounding neighborhood. The wide berth Ann Arbor gives to residents to not maintain their property leads to many Ann Arbor homeowners who do not care what the impact of their property and home is on the community, whether they live on the property or not. Tue, Mar 20, 2012 : 2:58 p.m. This home is not worth the mortgaged amount or anywhere near $140,000.00 in today's market. State law imposes a duty of repair on mortgagee banks as wel as owners - so the city should be going after the proper party for reimbursement. Tue, Mar 20, 2012 : 2:43 p.m. Put some graffiti on it and make the bank-owners pay to clean it up as cheaply as possible (which may involve partial demolition). Tue, Mar 20, 2012 : 2:20 p.m.
Why is the old abandoned Greek orthodox chuch on main still allowed to blight the city? Wed, Mar 21, 2012 : 1:46 a.m.
No kidding... it looks like a scene out of Detroit. And to top it all of I see homeless people sleeping in the large doorway! Tue, Mar 20, 2012 : 3:17 p.m. They tear down one house on some street and at least that is a start. But Ann Arbor needs to realize this. Ypsi Township and Detroit are way ahead of the game when it comes to tearing down blight. Ann Arbor? Get with it. Tue, Mar 20, 2012 : 1:43 p.m.
Everbank is a $12 billion Internet only bank. They have no local mortgage originators but operate a wholesale mortgage banking operation (www.everbankwholesale.com) that buys mortgages from mortgage brokers. This is the same business model that the mega banks who created a lot of the toxic mortgage securities pursued. This is a case study in the mortgage crisis: mortgage broker originates dodgy mortgage loan guaranteed by FNMA and sold to a large bank. Taxpayers pick up the tab for $200 billion (and growing). Local community is hurt. If you want to learn more about who is to blame for allowing this to happen, I suggest seeing &quot;Inside Job&quot;, the film that won the Oscar for best documentary last year. Wed, Mar 21, 2012 : 3:28 a.m.
@leaguebus: what they have a right to do depends on how they bid at the foreclosure sale. If they bid the whole mortgage amount due, this would release the borrowers from any personal responsibility. If they bid just the current value or some lesser amount taking carrying and selling costs into account they could go after the borrowers individually for the deficiency. Tue, Mar 20, 2012 : 2:54 p.m.
Mr Ranzini, why didn't the bank or FNMA go after the people that took out the $210K loan? Tue, Mar 20, 2012 : 2:33 p.m.
@Craig Lounsbury: thanks for pointing out my mistake. I did not realize that they have now changed their business model to add some branches. Sorry! Tue, Mar 20, 2012 : 2:06 p.m.
Tue, Mar 20, 2012 : 1:56 p.m.
&quot;If you want to learn more about who is to blame for allowing this to happen, I suggest seeing &quot;Inside Job&quot;, the film that won the Oscar for best documentary last year.&quot; Viewing this film should be mandatory for all U.S Citizens! Tue, Mar 20, 2012 : 12:42 p.m.
Tue, Mar 20, 2012 : 11:40 a.m.
&quot;The property had been registered to Gyll and Diana Stanford,&quot; Did Ann Arbor.com ask Gyll or Diana for comment? Tue, Mar 20, 2012 : 2:48 p.m.
http://www.stanfordenterprises.net/contact This is a 2011 web site, but it lists the South Street address as the main address. Tue, Mar 20, 2012 : 12:50 p.m. Yes, and I'm not sure &quot;outing them&quot; was a good idea. Who knows the circumstances that led to them leaving? Tue, Mar 20, 2012 : 12:40 p.m.
a house doesn't go from OK to &quot;needs to be torn down now&quot; status in months. Tue, Mar 20, 2012 : 11:59 a.m. I did not. Their role in the home ended months ago, prior to the disrepair becoming visible. However, since they're part of the public record and the transition to the lenders, I did include them in the story. Tue, Mar 20, 2012 : 11:32 a.m. There seems to be a lot of 'bank owned' and 'developer owned' properties throughout the city that are contributing to the urban blight problem. The only thing I can say is: &quot;How ironic!&quot; People complain about Graffiti, but I say crumbling and burnt-out buildings area bigger issue then a can of spray paint ever was!!! Tue, Mar 20, 2012 : 11:49 a.m.
too bad the spray painters don't stick to abandon buildings. Tue, Mar 20, 2012 : 11:30 a.m.
Tue, Mar 20, 2012 : 11:25 a.m.
By the time this is over, I'd expect Fannie Mae to cover the cost of the demolition. It's agents are participating in this effort with the city, based on my conversation with Ralph Welton. The city's blight fund was set up so that the city has the funds available to act quickly, when necessary, but that doesn't mean the city won't be pursuing the owner to cover costs. Tue, Mar 20, 2012 : 3:16 p.m.
Paula, as of the time of this reply, your original comment (as informative as it is) received half as many votes as did your spelling correction reply. I think this stands as one piece of evidence that readers (as contrasted to commenters, a subgroup) DO care about spelling and grammar. Achieving that to a high degree by the commenters is a worthy goal, of course, but not one that AnnArbor.com realistically can achieve by itself. However, proper spelling and grammar by the writers (staff, freelance and contributors) at AnnArbor.com SHOULD be achievable by whatever means AnnArbor.com might want to implement. It would show the proper respect for the English language (which I think should be a given by anyone undertaking a journalistic endeavor) as well as for the readership at AnnArbor.com. If there might be any doubt about the importance of this by the readership, I propose that AnnArbor.com conduct a poll (which the company does every few days, it seems). Let the readership voice its opinion about spelling and grammar. If the majority don't care, then greater attention to written submissions could be ignored. If, however, the majority should favor more attention to the writing on the part of AnnArbor.com, I hope it would consider undertaking the necessary measures to increase adherence to proper English usage. Thanks for the consideration, however much or little you give to it. Tue, Mar 20, 2012 : 11:55 a.m.
Tue, Mar 20, 2012 : 11:18 a.m. I resent spending Ann Arbor tax dollars to tear this property down. This is the Banks responsibility not the citizens of Ann Arbor. Where has our legal department been all of this time ??? Tue, Mar 20, 2012 : 11:13 a.m.
That mortgage was likely a tiny spec within a low grade mortgage=backed security which they never bothered to look in to. Just go out and get mortgages. This happened POST crash, as well. Which means even after ALL that, banks are going to go right back to (bad) business as usual because they are not the ones at risk in these transactions. I wonder if they, too, were betting against their own bad loans? Are you correct, AFTER &quot;the sheriff's sale before handing it off to Fannie Mae&quot; Why, oh why would Fannie Mae take it at this late date, knowing that it is not worth $210,000? Tue, Mar 20, 2012 : 11:08 a.m.
great it's coming down, but i'd like to ask mayor hieftje why it's alright to leave the ghetto on north main/summit in place for years? 5 houses and then the old greek church all falling to pieces for at least the last five years. not to mention the former gas station(?) on east summit/north main and the floorless and partially roofless house at the corner of west summit/wildt or how about the house which has been rotting and the site of a couple of fires (one of which burned down the garage) in the curve of kingsley - for ca. 12 years? the list is literally endless. which council person is representative of this ward? is s/he one of hieftje' s buddies? i would like to know. Tue, Mar 20, 2012 : 10:49 a.m. The headline of this article is incorrect. The home is owned by Federal National Mortgage Association (FNMA or Fannie Mae), which is NOT a &quot;bank&quot;. A &quot;bank&quot; may never even have had *anything* to do with it, and a &quot;mortgage broker&quot; may have originated this dodgy loan and sold it to Fannie Mae. Please be more careful in the future not to malign &quot;banks&quot;! Tue, Mar 20, 2012 : 1:53 p.m.
@a2roots: I posted that data previously on AnnArbor.com in a discussion I had with the &quot;Ghost of Edward R. Murrow&quot;. Since I am out of my office I can't readily pull it up, but if you care you can dig up what I wrote. The punchline is that University Bank has been a good steward of it's customers' deposits and our track record is excellent. Whenever we foreclose on a home (having exhausted other options), we fix the home up so it is always in better shape than when we get the keys. Overall we have had few foreclosures and most were the result of customers walking away. Tue, Mar 20, 2012 : 1:38 p.m.
Banks have been just as culpable as mortgage bankers and brokers. I would certainly be interested in seeing your servicing history on loans you hold as they compare to ones that you have sold. Tue, Mar 20, 2012 : 12:46 p.m.
Oh please, we all have plenty of reasons to feel less than happy about banks. That would include Fannie Mae and especially the Federal Reserve. No sympathy for banks here. Anyone (bank) who financed this loan would have had an appraisal first. Tue, Mar 20, 2012 : 12:31 p.m. I see Paula already corrected it below. It WAS a bank. Tue, Mar 20, 2012 : 12:29 p.m.
part one of your statement is fact. The rest is conjecture. You should stick to facts. Tue, Mar 20, 2012 : 11:22 a.m. Please explain more in detail how this works. All we hear is &quot;greedy bankers&quot; when I'm sure bankers never would want to make bad loans such as this. It seems that the availability of FNMA to readily buy poor quality loans that were issued by these &quot;mortgage brokers&quot; has caused a lot of this mess. Tue, Mar 20, 2012 : 10:48 a.m.
Who made the loan for $210,000, which as &quot;SillySally&quot; suggests, was irresponsible. My bet would be that it was not one of our local banks but some fly-by-night loan company that sold the mortgage within days of writing it. But this would be an interesting case study of the national housing fiasco. Tue, Mar 20, 2012 : 10:36 a.m.
Wow, That's our government at &quot;work&quot; buying up such bad loans as this for $210,000 and encouraging bankers to make more bad loans. Did anyone even drive out and look at the place? $210k for it? One glance would make me wonder about its condition and care. Did they even use home inspectors? They would notice the structural issues and say, &quot;do not buy it or re-finance it. The lack of such controls and banks or Fannie Mae being left honkding an empty bag is how this financial mess began. Not silly, criminal. Tue, Mar 20, 2012 : 12:43 p.m. Correct me if I'm wrong but I believe this is a &quot;walk away&quot; foreclosure. The loan was probably already owned by Fannie Mae and was defaulted on. That leaves them the owner, not the buyer. If it was in better shape it might have qualified for a Homepath Renovation loan, where someone could buy it for as little as 3% down and roll renovation costs into the mortgage. Now this once nice old house will be a pile of rubble soon. The style does seem to be from a different neighborhood, as the neighbor said. Looks like it needs to come down, however, I believe the bank should pay for any expenses for its removal -- this should not be a tax paying freebe. Wed, Mar 21, 2012 : 12:15 a.m. If Fannie Mae ownes the note on the property....the tax payer is already paying for it to be demolished.